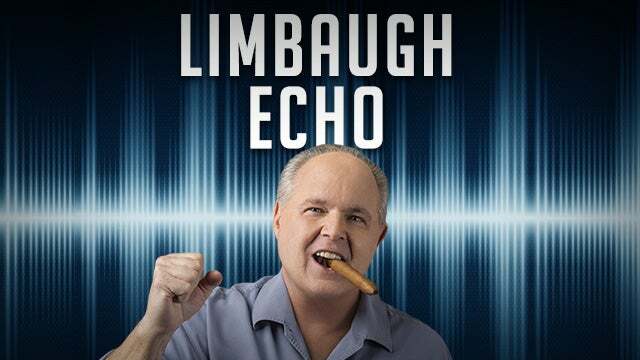 RUSH: Hey, look at this headline: “Liberalism Must Be Destroyed.” Where have you heard that? (interruption) What, you’re all saying you’ve heard it right here? Is that right? You remember hearing it here? (laughing) For almost like 30 years, right? But, I mean, intensely in the last year and a half, two years. Remember, I went to the Media Research Center annual gala, and they play at this gala, highlights — the award winners — the most outrageous examples of left-wing bias, stupidity, and ignorance. I’ve been one of the judges in that contest each and every year for 25 years or so. So they asked me to come and keynote the dinner this year, and I did, and I noticed everybody laughing — which, I mean, it’s unavoidable. Everybody was laughing at all of these outrageous examples of liberal-media ignorance, stupidity, hate, bias, what have you. I looked around, and I saw the room. It was like thousand, 1200 people, and they’re all laughing. It reminded me how I used to laugh starting in Sacramento in the eighties with the great Peace March for Global Nuclear Disarmament, and then the environmentalist wackos and the spotted owl. You know, Earth First, and then all subsequent organizations and efforts of the left and some of the crazy things the environmentalist wackos said. We used to laugh at ’em, and we’d say to ourselves, “Nobody… (laughing) Nobody is gonna fall for this! Nobody’s gonna believe this.” We come to find out that stuff that we all laughed at has become mainstream left-wing radicalism. This is the stuff that your kids are taught in school. You’re paying $20,000, $40,000, $60,000 a year to send your kids away to actually become members of a cult, which is what I think higher education is today. Your kids are being indoctrinated into cults of left-wing radicalism. So I said in my remarks, “Folks, we laugh at this, but they believe it. They believe it, and there is no more common ground. We don’t overlap. There is no slight area of commonality where we can compromise or agree. They are entirely different from us,” and the room got quiet. The room got very sober — and I didn’t mean to be taking their fun away. But I think the idea that we have to defeat the left? Yeah, some of us agree, but not enough. You know, the conservative intelligentsia in Washington doesn’t want to defeat them. The conservative intelligentsia in Washington doesn’t even believe that we’re in the midst of a crisis in our country. They believe that it’s possible to peacefully coexist as long as you have good manners. And as long as we have respect for the other guys, that it’s possible out and have an adult bench and talk things over and get along with you. But they don’t see any need to defeat them. Which, when a guy like Trump comes along and starts defeating them, look what they do. The conservative intelligentsia lashes out at Trump as he is, in many ways, implementing things they have claimed to believe in and support their whole lives. And I have been on this intensely for two years. We all want to compromise. We all think there’s virtue in it. We all think that it would be a great thing to be able to come to some mutual agreement on things just to lower the intensity level. But it isn’t possible ’cause we don’t have any areas of overlap of commonality. So when you start talking about compromise, if you begin to compromise your principles just to get along, what good is that? And, by the way, their definition of “compromise” is us caving on our principles. So, anyway, I saw this headline (it was sent to me) at Townhall. He said, “I’m not! I’m not sucking up. I’m telling you I turn on the TV, I read, and I think so many things that you’ve been saying…” Well, they add up after 30 years. But this by Mr. Hunter, “Liberalism Must Be Destroyed,” here’s how it begins: “If you thought conservatives could ‘make nice’ with liberals, that ‘both sides have the country’s best interest at heart,’ you were wrong. This week more of the con-jobs and character assassinations the political left is attempting have been exposed, and if it doesn’t make you realize the Liberal-Industrial Complex will stop at nothing to protect itself and destroy the Trump administration, nothing will. An example here is given of John Kerry. I haven’t mentioned it yet, but here is John Kerry… This is nothing new, by the way! But we’ll deal with it. John Kerry is actually negotiating with his former counterpart in Iran in an attempt to undermine what the duly elected president intends to do regarding the Iranian nuclear deal, and people are shouting, “Logan Act violation! Logan Act!” Nobody’s ever been charged with the Logan Act. That’s not what’s gonna happen here, and it’s not the way to deal with this. The way to deal with this is sunshine. People that voted for Donald Trump are not stupid. When this news appears, it has its desired impact. John Kerry is not beloved. There’s not a whole lot of people sorry he’s gone. There aren’t a lot of people wishing he was still secretary of state. The left may be out there cheering, but the left is not growing, folks. Well, wait a minute. Let me rephrase that. Within the current time frame, the left’s political fortunes are not expanding, contrary to all the conventional wisdom out there. They don’t have this next election in the bag. They may think they do. They talk like they do, they act like it, but they don’t. ‘Cause nobody yet knows what’s gonna happen. The one thing that we do know — the one thing that we can be very confident of — is that the Trump base is not gonna abandon him. Now, Trump is not gonna be on any ballot this coming November. So we have to factor that. But Trump’s voters know full well what they have to do to support him. Most of them. I mean, there are exceptions to everything. But the idea that this is new? This is not new. Let me take you back to Ronaldus Magnus. Ronald Reagan, president from 1981 to 1989. And during that period of time Ronaldus Magnus had as one of his stated intentions to destroy Soviet communism. And, by the way, he did. The American the Democrat Party was staunchly opposed to defeating Soviet communism. The Democrat Party of the 1980s was actively supporting Soviet client state communists, such as in Nicaragua. 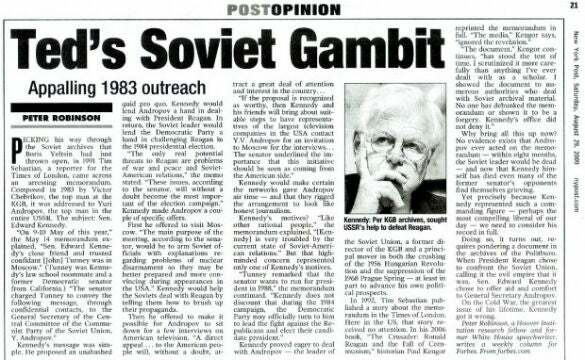 During the 1980s, Senator Edward Kennedy actually wrote a letter to the Soviet leader at the time. They kept dying back then, so I’m not sure if it was Andropov, Yuri Andropov. I don’t know if it was Chernenko. I forget who. But he wrote whoever it was a letter asking the Soviet leader (paraphrased), “Don’t panic. Do not be impetuous. President Reagan will be dealt with in the United States. Do not do anything dramatic. We’re eventually going to be back in control.” It was a letter of pure sabotage of the Reagan administration. The Democrat Party supported a client state in Nicaragua and were doing everything they could to undermine Reagan administration efforts to help Nicaragua remain independent so that it would not become a Soviet client state. Many Democrats signed what was called a “Dear Comandante” letter. The guy they supported down there was a man named Daniel Ortega, and the Democrats defeated a Reagan administration budget proposal that would have authorized money for the Contras in Nicaragua, the Nicaraguans opposing the Soviet client state. Immediately after that vote, Daniel Ortega got on a plane and flew off to Moscow and had a public celebration with Soviet leaders. He happily announced that the Soviets had committed to spending something, some hundreds of millions of dollars in Nicaragua for Ortega. And then Ortega got on a plan and went to New York and went shopping with the song stylists Peter, Paul, and Mary. Peter, Paul, and Mary took Daniel Ortega on a shopping spree to buy sunglasses! So this is nothing new. The Democrats wrote Ortega a letter called the “Dear Comandante” letter. “Please don’t embarrass us like this. We give you what you wanted the U.S. Congress and you slam it right in our face by having a public meeting with the Soviets? You can’t do this!” So they knew what was going on, and there are countless other examples of this kind of thing. When George W. Bush was president, you had both Clintons — Hillary Clinton and Bill — and Algore, who were traveling internationally and delivering anti-Bush statements, anti-Iraq war, anti-war on terrorism. The idea that Democrats undermine sitting Republican presidencies is not new. But it is going to have a different impact this time that the left is not calculating and the media isn’t calculating. The media is trying to ignore the Kerry story and not hype it. They’re privately cheering it and hoping that Kerry continues. But this kind of stuff? They don’t realize that this is helping Trump, because, again, they do not yet today know who the Trump voters are. They do not know the Trump base. They have to be destroyed. And how to do so? Yes, the ballot box is key. And then the judiciary. The judiciary is where the Democrats and the left have their election insurance. When they lose, they still have the power of the judiciary in their back pocket. At any rate, I just wanted to point it out ’cause the idea is spreading, and you might think, “Rush, it doesn’t need to be spread. Everybody.” No, folks! Everybody doesn’t think the left has to be destroyed, defeated. They don’t think that. You’d be amazed at the number of people still, particularly elected Republicans who run for office. There’s a guy in North Carolina, Thom Tillis. He still runs on the idea of walking and reaching across the aisle. Corker, these guys, they don’t get it.